The Harrison County chapter of the RTA was organized in 1966 under the leadership of George Redman, a former Superintendent of Schools. Membership has varied from the original 12 to about 70 members, most also ORTA members. Chapter programs over the years have included educational, pension system, legislative, historical and entertainment information plus visits to local areas of interest. Generally, the ORTA Director and a retired teacher on the STRS Board are invited to speak each year. 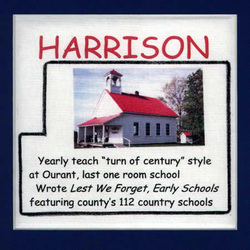 Among the projects of the chapter, perhaps the most outstanding was publishing Lest We Forget - Harrison County Early Schools, edited by Ruth Dotson on the 112 early schools. Other past projects included generous contributions to the Puskarich Public Library and to the resotration of Ourant School, the county's last one-room school. Each year retired teachers and members of the Ourant School Foundation teach sscond grade classes using "turn of the century" style lessons. Former President, Isabelle Wallace, along with members of the Ourant Foundation, developed the curriculum and teaching materials (including McGuffey readers). Notable past members of the chapter include Dean Harrah, named "Man of the Year" by the Ohio Baseball Hall of Fame for more than 60 years of actively playing and coaching youth athletics, Dorothy Birney (taught 55 years), R. A. Kammeyer (the Jewett Opera House was named in his honor), and Martha Haverfield, a chapter leader dedicated to recruiting new members. Past and current members have contributed to the community in many ways: volunteering at the Harrison Community Hospital and local hospices, with the Ruritans and DAR to recognize top students and at their churches. Current notable include Mary Ford, author of a historical column, Twice Told Tales for the local paper; Clarence and Joyce Lannum, long term officers in the Deersville Community Players; Anita Coultrap,Assistant Director, Chamber of Commerce; Carolyn Addy, member of the county Board of Elections; Robert Hugh, past county commissioner, and Bette Hill, chair of the Mental Health and Recovery Board. Several members are active in lobbying state and federal legislators on behalf of retired teachers and educational issues.